With Quattro all-wheel drive, the Audi A4 confidently displays its rings. 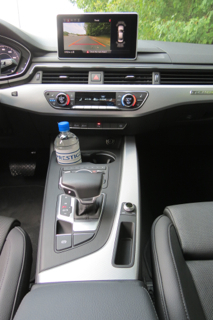 The Audi A4 is a compact entry-level sedan, one of two such models offered by this German luxury manufacturer. It is sized slightly larger than the A3 and offers standard front-wheel drive and available all-wheel drive, the latter based on the brand’s much-heralded Quattro technology. Fully redesigned for 2017, the A4 advances a familiar exterior design while gaining an all-new interior. 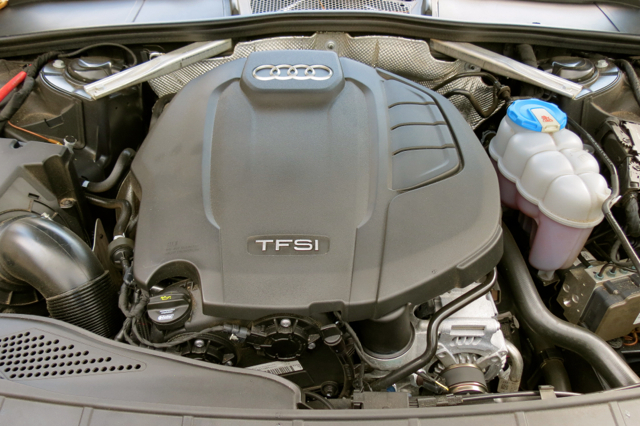 Under the hood, a new 2.0-liter four-cylinder engine debuts, making 252 horsepower and 273 pound-feet of torque. Power is sent to the front or all four wheels by way of a seven-speed dual-clutch transmission. Clean, yet elegant lines define the 2017 A4. 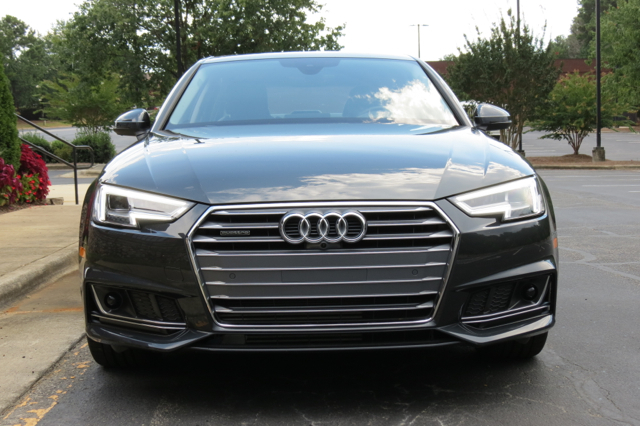 The front fascia is dominated by a large, trapezoidal grille with Audi’s trademark four-ring logo at the top. A pair of wedge-shaped headlamps touch the upper end of the grille. At the grille’s base are sporty embrasures housing the fog lamps. Distinctive character lines cross the hood from front to back edge. Another character line dominates the profile, connecting the front and rear lights. Lower body sculpting, fashionable alloy wheels, and a high belt line are additional standout features present. High-quality materials, exemplary fit and finish, and a clean uncluttered look are hallmarks of the Audi brand. The A4 advances that theme, something I have appreciated since Audi entered my media fleet rotation a few years back. The 2017 A4 offers seating for five, but if you’re consigned to the rear seat you need to be small or not mind the cramped legroom. I’m the type of drive who likes to push his seat nearly as far back as it goes, so pity the person who sits directly behind me. Yes, in a pinch you can fit two or three people back there, but if you’re looking for more room then consider the A6. Otherwise, the A4 does what it needs to do and that is to provide a logical entry place to the Audi brand for the up and coming executive. The A4’s instrument gauge is composed of a pair of circular dials flanking the digital driver’s information center. The controls for that center are on the face of the steering wheel. The center stack is a minimalist design with the color screen fixed on top of the dash followed by vents, then knobs and switches to manage the climate control system. At the base of the stack are the ignition button, a pair of cup holders, seat climate control switches, the MMI dial for the screen, the transmission shifter, an electronic parking brake, and storage compartments. 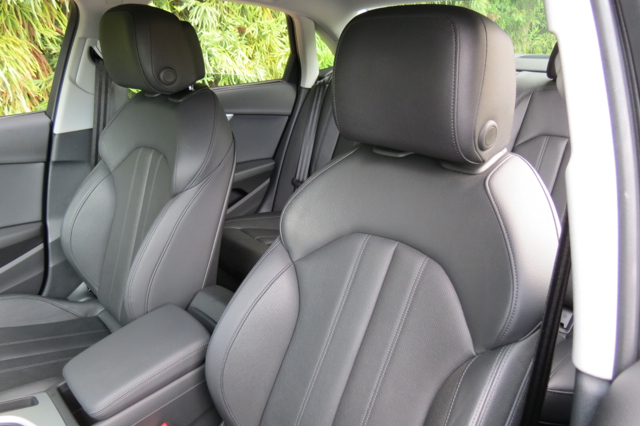 Although the rear seat is tight, the front seats are comfortable, supportive, and generously covered in leather. The eight-way power adjustable seats include four-way lumbar support for the driver. Other materials in evidence include a cloth headliner, aluminum door sills and inlays, and leather touches. Ambient LED interior lighting elevates the interior presentation. All 2017 A4 models feature three-zone climate control, an aerated glove box, and a power tilt and slide sunroof with a sunshade. The rear windows come with manual sunshades. Technology and Audi go hand in glove. Standard across the model line is MMI — multimedia interface — another name for infotainment and navigation. The big dial just in front of the transmission shifter controls same — simply rest your palm on top of the shifter to manage the dial. It is a fairly simple and straightforward system, making it easy to control important system functions including the radio, media, telephone, and navigation. I especially enjoyed the detailed Google Maps, what provide high-level details anyone can understand. Some in-car map systems are truly elementary — offering simple layouts with not much information. Audi not only takes you to your destination, but you’ll see neighborhood and community details, 3D imaging, as well as business and landmark information. All A4 models are equipped with a pair of USB ports, offer Bluetooth connectivity, and supply at least a 10-speaker audio system with a CD player and an MP3 player. Move up to the Premium Plus level and the standard audio system is swapped out with a 19-speaker 755-watt Bang & Olufsen audio system. Simply inspirational! Choose the Prestige Plus and you also receive a 12.3-inch digital instrument cluster. For 2017, the Audi A4 garnered a Top Safety Pick+ rating from the Insurance Institute for Highway Safety (IIHS), the institute’s highest score. Enabling Audi to achieve the top rating is its standard pre sense city with an automatic emergency braking system, what gives the 2017 A4 a “superior” score in front crash testing. The system has been designed to detect both moving and stationary pedestrians and vehicles at speeds up to 52 miles per hour. Once detected, braking is automatically initiated to prevent a collision. 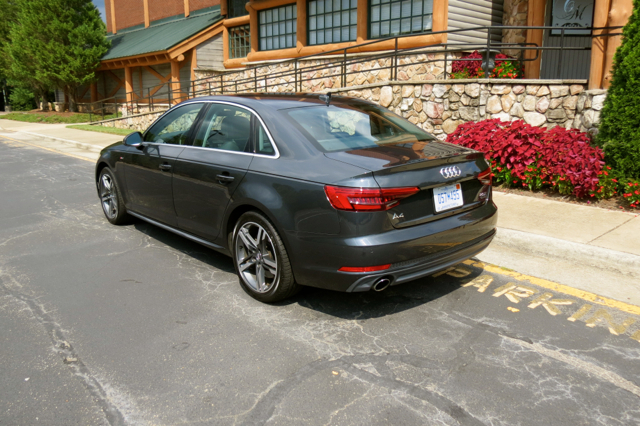 On the Premium Plus level, the A4 adds a parking plus system composed of front and rear acoustic sensors and a rearview camera. Rear cross traffic alert is added to the Prestige level. All three Audi A4 trims offer standard front-wheel drive and available all-wheel drive. All models, except for special “Ultra” front-wheel drive editions, are powered by the previously mentioned 2.0-liter, turbocharged four-cylinder engine paired with a seven-speed dual-clutch transmission. This engine is quiet, delivers copious amounts of power, and moves forward at a fast clip. Turbo lag, the bane of this type of forced induction technology, was surprisingly absent. As for the Ultra models, the same engine is used, but the compression ratio has been raised and its fuel economy achievement with it. This also means you’ll experience a trade-off in performance — the Ultra models are a second slower than the standard models when going from 0 to 60 mph. Unlike BMW and Mercedes-Benz, Audi relies on front-wheel drive architecture for its cars. This fact would be a huge demerit in some circles, but with its all-wheel drive system available, those concerns are largely extinguished. Indeed, Audi’s “Quattro” all-wheel drive is amongst the best drivetrains out there. For 2017 the A4 has gained a stiffer body structure and a redesigned suspension system. Add in the first-ever adaptive shocks, your choice of driving modes, and electric steering and this sedan is a joy to drive. Helping matters immensely is Audi Drive Select, what allows the driver to modify steering, throttle, transmission, and damper inputs through the attendant controller. Choose eco, normal, sport, or sport+ modes to find the right driving feel for the moment. Take to your favorite twisty roads and you’ll quickly learn how well the A4 behaves. The adaptive dampers are a must if you enjoy spirited driving, although the steering provides minimal feedback. Nevertheless, the A4 dashes down the road with ease and handles corners without much body movement. Not once did I find myself pining for a traditional rear-wheel drive platform. The entry-level 2017 A4 is priced from $34,900. This supplies you with a front-wheel drive Premium “Ultra” model. Choose all-wheel drive and you’ll pay $39,400. The Premium Plus “Ultra” model will cost you $38,700; add $4,500 for all-wheel drive. Choose the Prestige edition and you’ll pay $45,900 or $48,000 for all-wheel drive. Expect to pay about $45,000 for a well-equipped Premium Plus model with all-wheel drive. You’ll get all the amenities listed and shave a few thousand off the top-of-the-line price. If you can live with front-wheel drive, further savings can be had, but once you play around with Quattro all-wheel drive, you may not look at anything else. Consider the system, both for your driving pleasure and for the added handling benefits it affords. 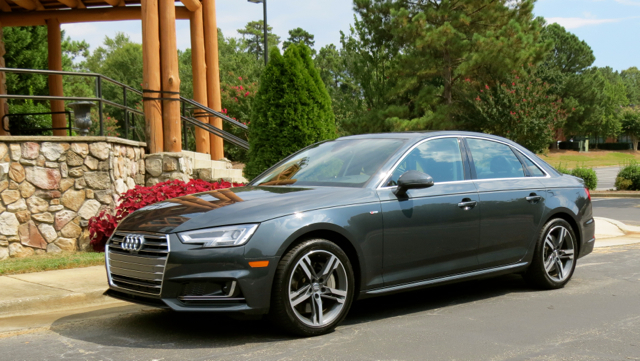 The redesigned 2017 A4 puts forth a strong effort in the competitive entry-level luxury segment. The BMW 3 Series may still be the industry benchmark, but for people who want something different, the Audi is worth exploring. Other models in this segment include the Cadillac ATS, Mercedes-Benz C-Class, the all-new Jaguar XE, and the Lexus IS. Sadly, there is no diesel model currently available as these engines were pulled from the market in 2016 following the Volkswagen Group’s disclosure that the company had manipulated emissions data. That said, the turbo gas all-wheel drive model earns an EPA-estimated 24 mpg in the city and 31 mpg on the highway, highly competitive numbers in this strong segment.